The Unique Guitar Blog: Josh White Guitar - The First Signature Guitar named for an African-American. Josh White Guitar - The First Signature Guitar named for an African-American. Recently I was talking with a friend about recordings, and he brought up Josh White. I knew very little about this man. What I did know was that the first signature Ovation guitar was The Josh White Model. 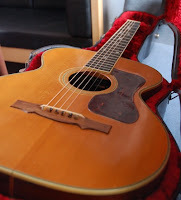 So I did a little digging, which involved watching a most interesting episode of History Detectives about a Guild guitar that belonged to Josh White. In the program it was claimed this could possibly be the first signature model ever named for an African American guitarist. If we are referring to all guitars, acoustic and electric then dispute that fact. For many years, guitar manufacturers and luthier have created guitars for well known players in hope that customers would purchase products named for these players. Players purchased signature guitars in hopes of sounding like their favorite players. 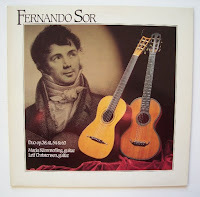 As far back as the 1830, builder such as Johann Stauffer, and René Lacote built signature guitars for players such as Luigi Lagani, Fernando Sor (whose guitars studies are still in use at conservatories), and Napoléon Coste. 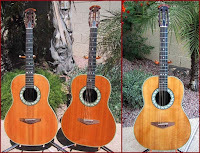 In fact the first known 7 string guitar was designed by Coste, and built by Lacote. The first American company to produce a signature guitar was Gibson. In the 1920’s singer-guitarist Nick Lucas was all the rage on phonographs. 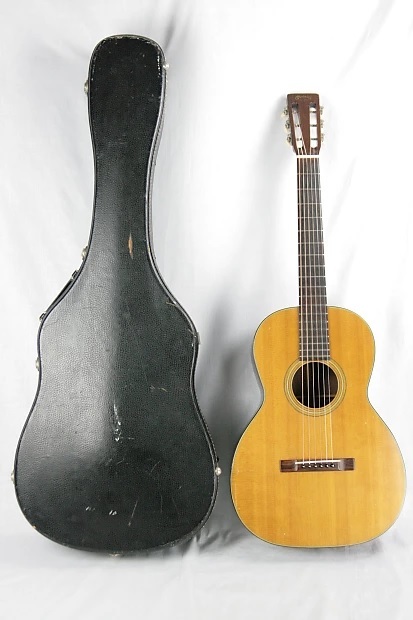 By 1926 Gibson produced a signature Nick Lucas model. 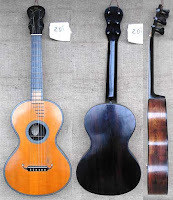 This was updated in 1935 to a 14 fret neck. Though the C.F. 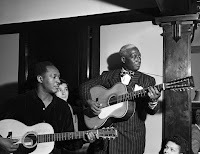 Martin Guitar Company created some early models for popular recording stars, it was not until recently that signature models were produced. The same could be said for Stella guitars, which were played by so many Blues guitarists. There was never a signature model. Josh White had a fascinating life and career as a musician. He went on to become a torch bearer for the Piedmont Blues style of music. At the age of 5 Josh White’s mother, who was in dire financial straights gave him to a Blues musician named Blind Man Arnold, who took him around the country for the next 8 years. Arnold would sing and play guitar, and young Josh would dance and collect coins in a tambourine. Blind Man Arnold sent White’s mother $2 a week. 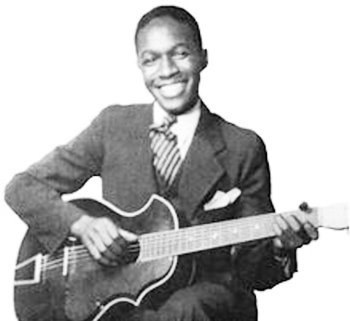 Arnold then rented out young Josh White other Blues street musicians, to help them attract customers. Finally a record producer for Paramount records recognized White’s talent and through legal action was able to free him from this indentured servitude. 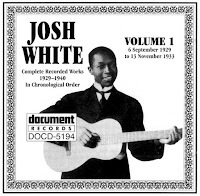 By the 1930’s Josh White began a career singing Gospel songs as The Singing Christian. During this period of time White injured his hand. It went untreated and became gangrenous. For a while White went to work a dock worker and during this time exercised his hand by squeezing a rubber ball until he could once again play guitar chords. By the 1940’s he starred in a musical called John Henry, playing the part of Blind Lemon Jefferson. This lead to a meeting with Eleanor Roosevelt, and many visits to the White House, including a performance at the inauguration of President Roosevelt. A Greenwich Village club called the Café Society was frequented by a racial mixed audience and racially mixed musicians. This not only opened the door to New York society, but to European society as well. 1950 brought the onslaught of McCarthyism, and the witch-hunt for Communist sympathizers. 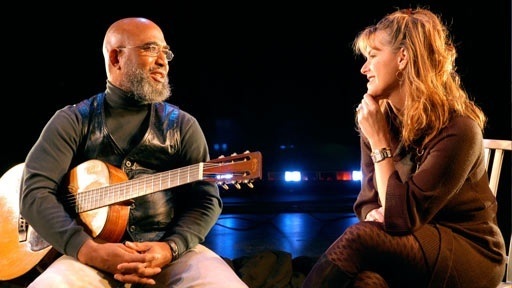 Many actors, artists, and musicians fell prey to the House Committee on Un-American Activity, and were black-listed from working in their respective industries. 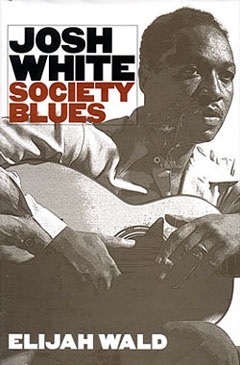 Although White was neither a Communist or a sympathizer, he interjected protest songs into his stage act, to express human rights for all people, including people of colour. Josh White found little work after that in the United States, and went to England to start playing in London Clubs. He stayed there for the next five years singing and acting in performances for Granada Television. 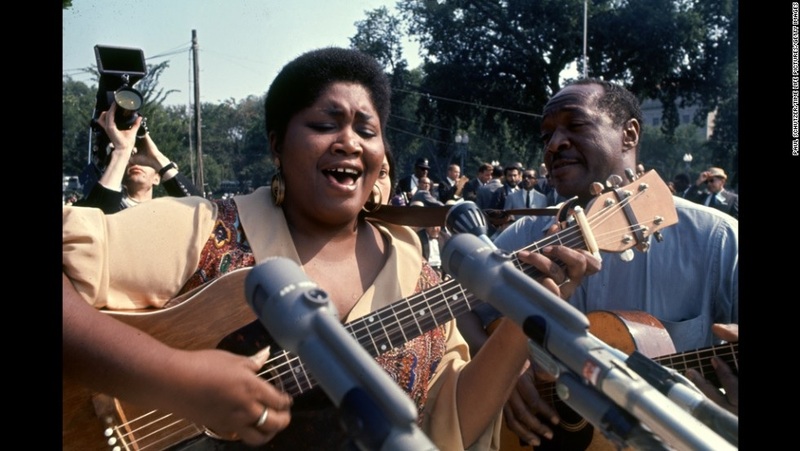 Upon moving back to the United States, he performed at the 1963 March on Washington, alongside Reverend Martin Luther King, Peter, Paul, and Mary, and others. His career picked up steam as the popularity of Folk Music increased. 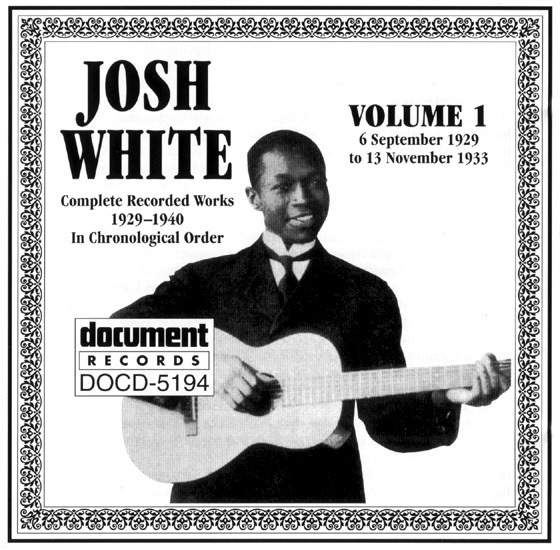 For much of his career, Josh White played a Martin 00-21 12 fret guitar. This guitar has a wider neck and is sometimes referred to as a New Yorker model. The bridge on this guitar was a flat piece of rosewood, not typical of Martin guitars of the day. The bound top was solid spruce, and the back and sides were rosewood. The rosewood fret board was wider than most models. The headstock was slotted with open machine tuners. While in the U.K. and Europe, Josh White was approach by the music company Boosey and Hawkes to put together a guitar method book. Boosey and Hawkes is still one of the World’s biggest publishers of written music, and at that time were manufacturing a variety of musical instruments. 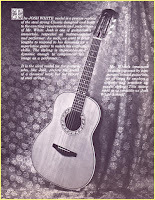 To go along with their book, they also created a Josh White guitar under their Zenith brand name. 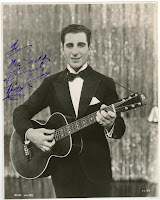 As a young man he also played a mid 1930’s Kay Kraft guitar, made by the Stromberg Voisinet. This was a very interesting instrument, since there is a small bolt on the neck heel that easily turns to adjust the string level. 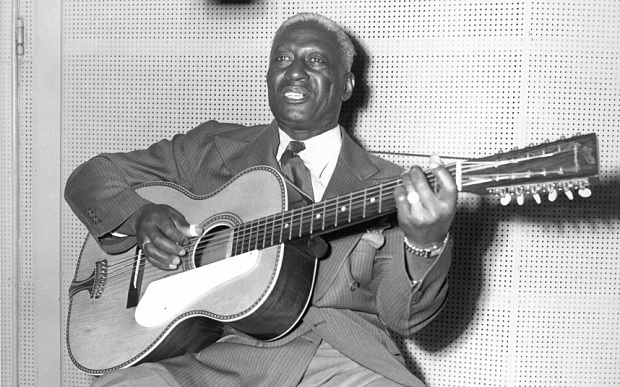 He also played a variety of Martin guitars and usually favored a large pickguard; sometimes using two pickguards. 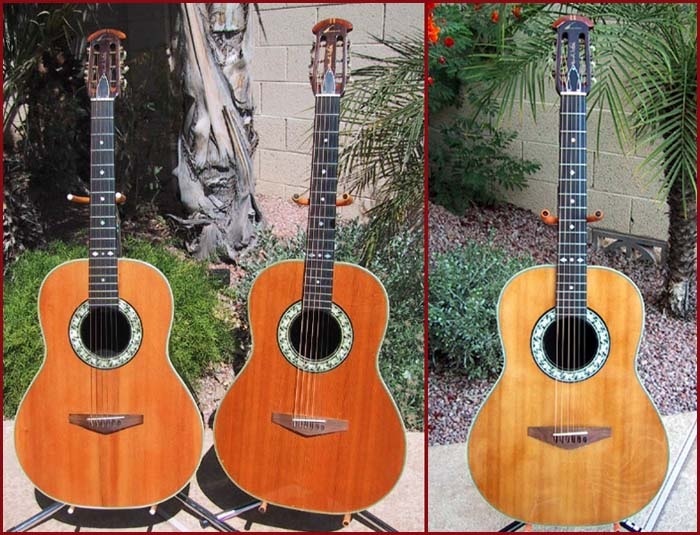 By 1965 Charles Kaman created the one of the first ever Ovation guitar with the fiberglass (Lyracord) back and solid spruce top, and the neck joined the body at the 12th fret. 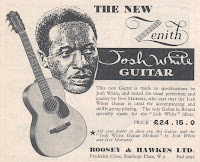 In 1967 the company offered the a signature guitar build specifically for Josh White and had a wider neck. The back had the parabolic fiberglass bowl. The name Josh White was written on the slotted headstock between the strings. Prior to offering the guitar to the public, Josh White was presented with his signature model during an appearance at the Hotel America in Hartford Connecticut in 1966. Later that same year, 1966, Al Dronge, owner of Guild Guitars, of Hoboken, New York, built a special model for Josh White. 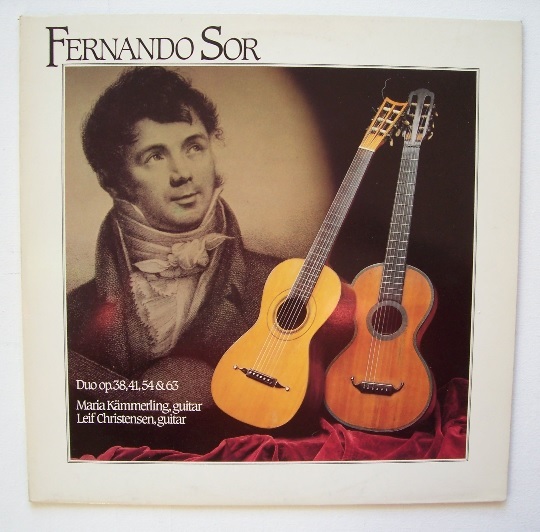 This was a gorgeous instrument and it featured a wide neck, a slotted headstock and an auditorium sized body. Guild may of initially set it’s sights on producing this model as a production guitar, however by 1965 Folk Music took a downturn, being replaced by The British Invasion. The Guild instrument never went into production. One interesting fact about Josh White is that in later life he suffered from psoriasis on his hands, which caused his fingernails to crack and break. This was tough condition for a finger-picking guitarist. Through his relationship with Ovation Guitars, one of the foremen at Kaman Industries made a cast of his hands, and produced fiberglass fingernails for him. These were attached with a new type of glue called Eastman 910 (which later is still be sold as Super Glue). 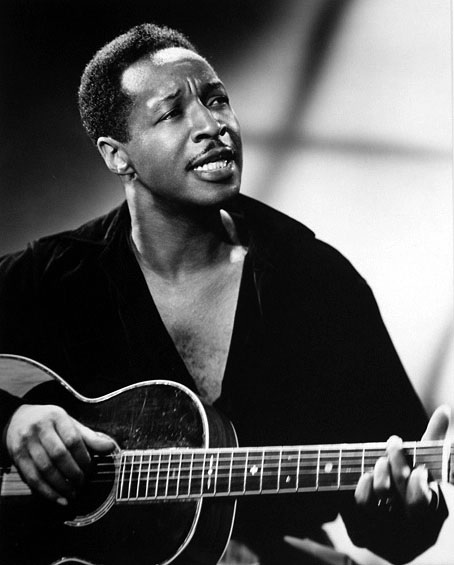 I mentioned earlier that I disputed the fact the Josh White was the first African American to have a signature guitar named after him. This holds true if we count only United States Companies. 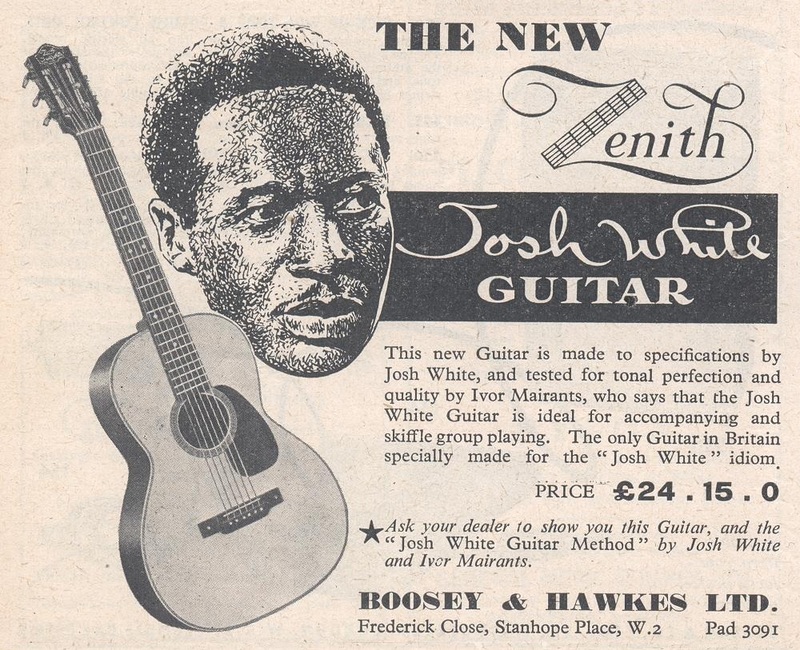 However if we look at companies throughout the world, it was in 1957 that Boosey and Hawkes produced the Zenith Josh White guitar. 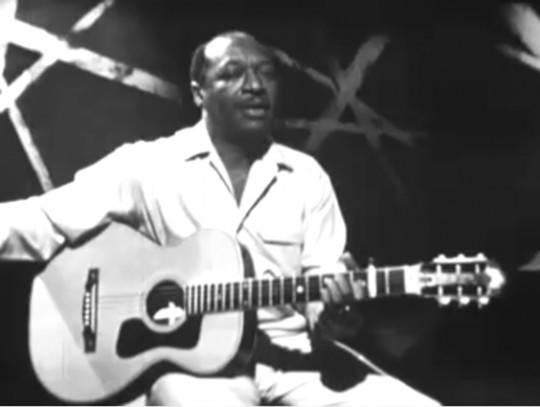 So yes, Josh White would be the first African-American musician to have a signature guitar. 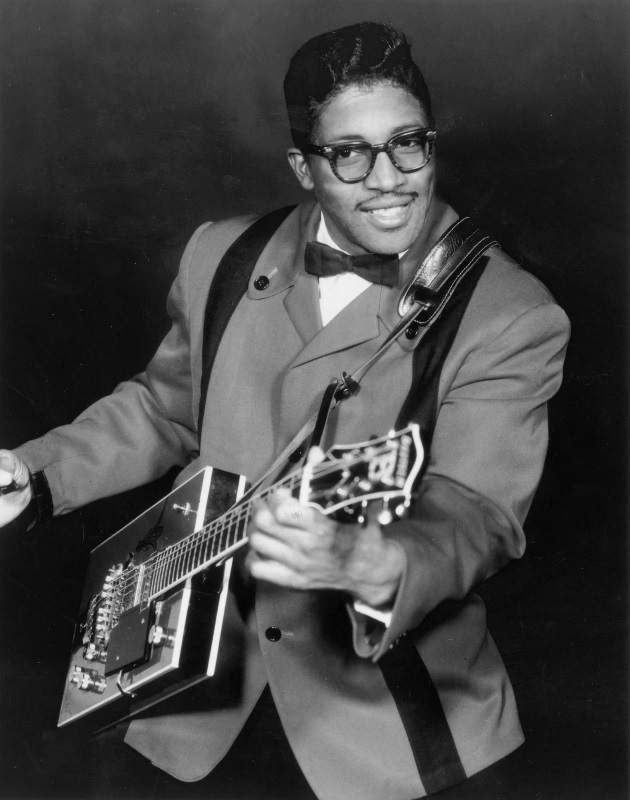 But in the United States, the honor of the first African American to have a signature guitar would go to Elias Bates, better known as Bo Diddley. 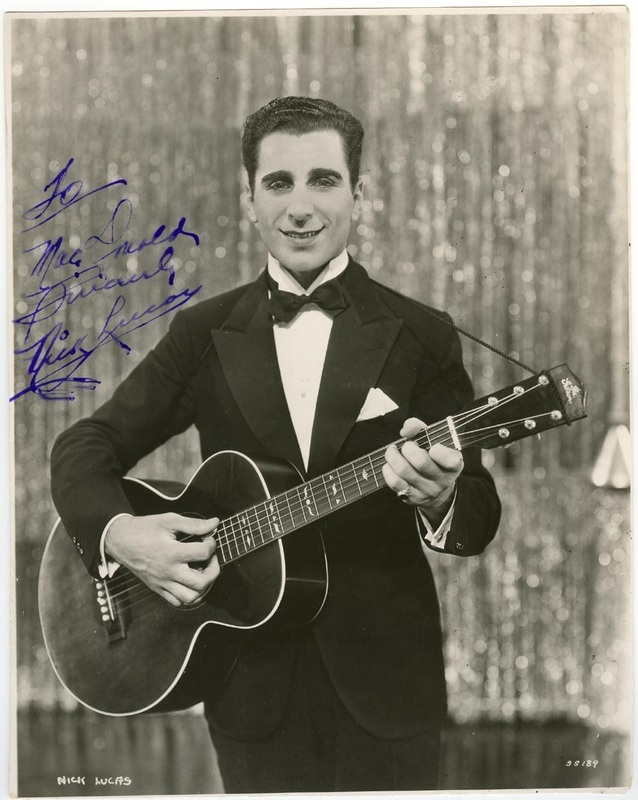 In 1958 he went to the Gretsch Guitar Company and persuaded a designer named Juiliano to built his rectangular cigar box shaped guitar which he dubbed The Twang Machine. That same year Gretsch Guitars also build another model for Bo that was based on the tail fins of a Cadillac of that same year. This was called the Bo Diddley Jupiter and was later re-christened the Billy-Bo Jupiter..
Other notable African-Americans to have signature guitars would include B.B. King, Richie Havens, Jimi Hendrix. Prince, George Benson, Wes Montgomery, Tracy Chapman, and Charlie Christian had a pickup named in his honor. Guilds "george barnes guitar in f" deserves mentuon too..